While we were looking through the binoculars at the beaver we could see a bir partially concealed standing at the far side of the pond. I took several photos of it and enlarged them to try to identify it. 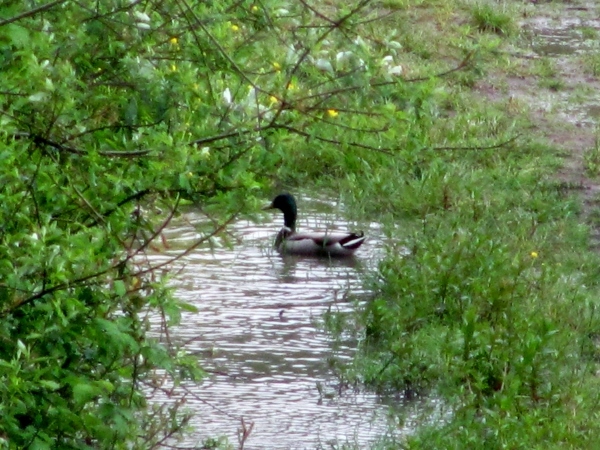 In my mind the term 'wood duck' sprang to mind and when I looked it up there he was pictured. 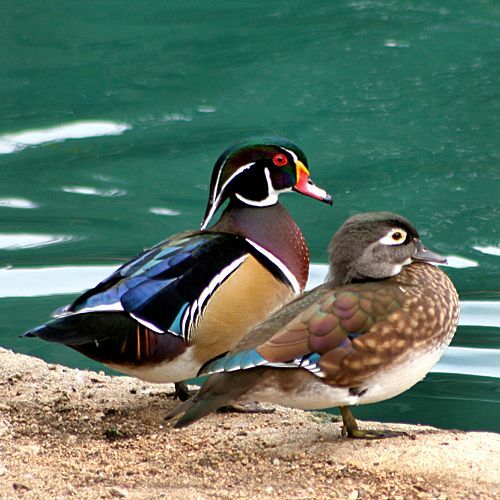 Whoever took this photo had a much better view and got this great photo of both the male and female wood duck. We've not had any of these before and we've been here since 1989! 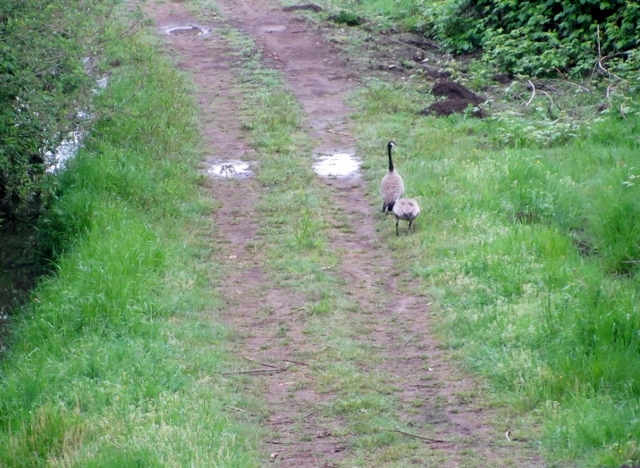 10 Canada geese have moved into the pasture across the road and down one house. They totally ignore the 5 horses that live there. Then today we saw 10-12 hummingbirds flitting in and out of the branches of the maple tree in the front yard. The birds are taking over! 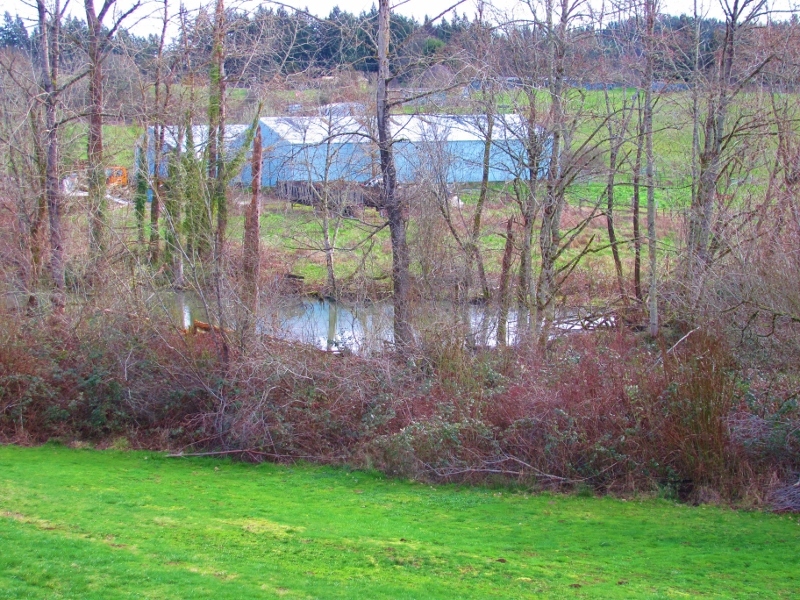 Now that fall is here and the leaves hav cleared from the trees, we have a nice view of the neighbor's pond again. When the air is still we watch for ripples on the water as a signal that the beaver is out and about. We had watched a documentary on beavers last year so we know that they use the trees and branches for two thing - building their dens and stocking food for winter (they eat the bark from small branches). We also assume this is a male beaver and not too old as it is new to the area and the males go off to set up a new home site when they have finished their apprenticeship of building with their parents and are ready to find/attract a mate. We're guessing, since he was here last year too, that he is about 4 years old. In any case, after watching with the binoculars, it occured to us to see if we could get photos. We're still not too thrilled with his den-building as he has changed the place where the creek exits so it no longer goes under the pasture access through the culvert but flows over it about 50 feet away. 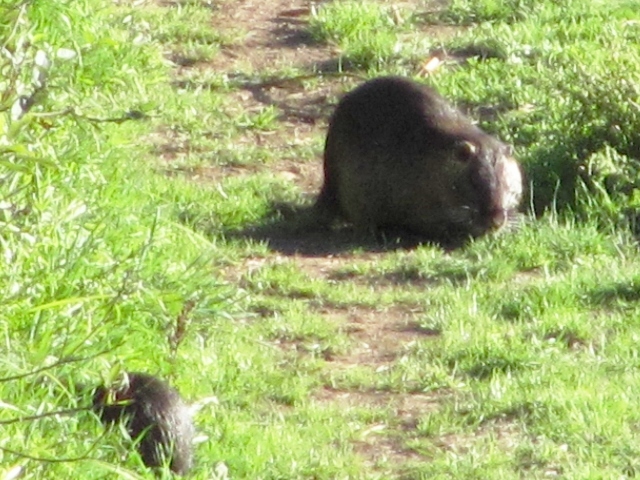 Giant rodents - gotta love em! 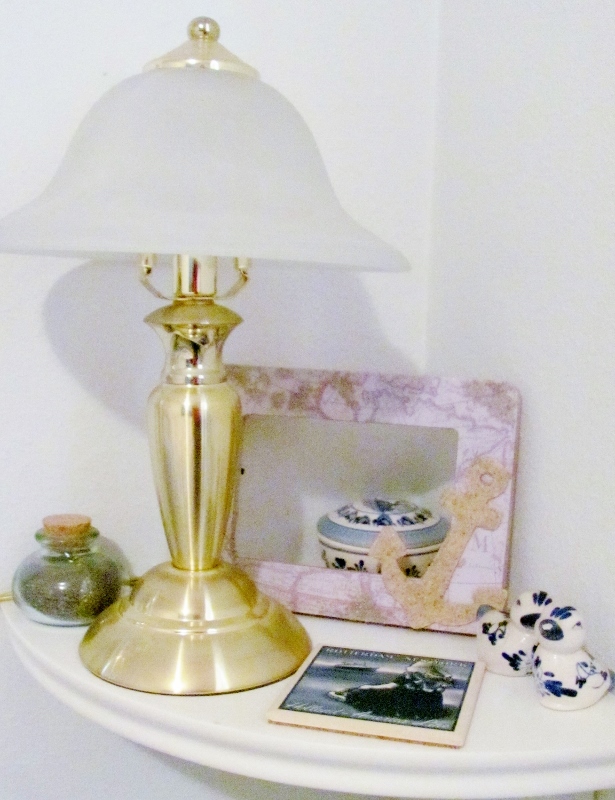 I found more things to include in the travel-themed guest room which meant that some of the previous things needed to be moved around. First in the door you come to the dresser. I didn't change anything on the top display but did take away the butterflies that were on the wall. In their place, I hung a little burlap bag that was a free gift when we bought coffee there. 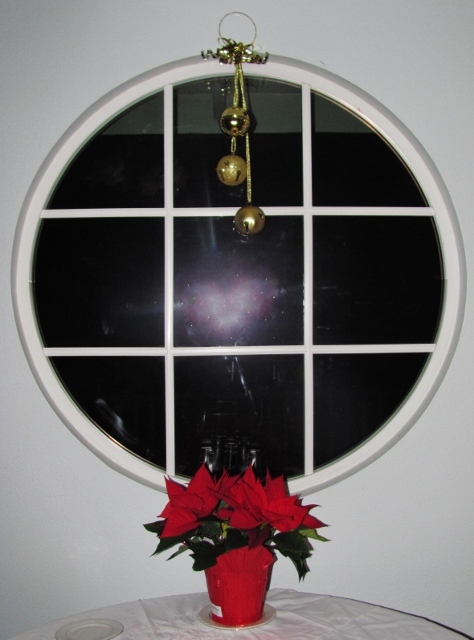 Next is the corner wall that is on the right side of the window. 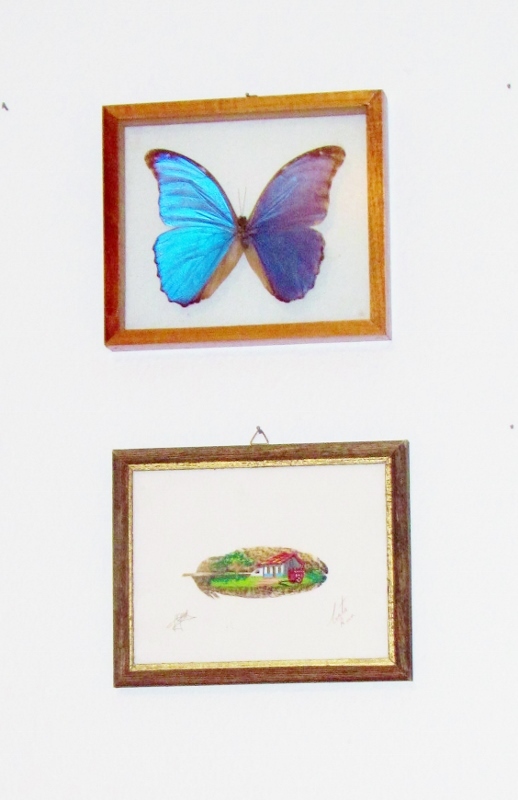 I moved the single butterfly and a painted feather (both from Costa Rica) here. 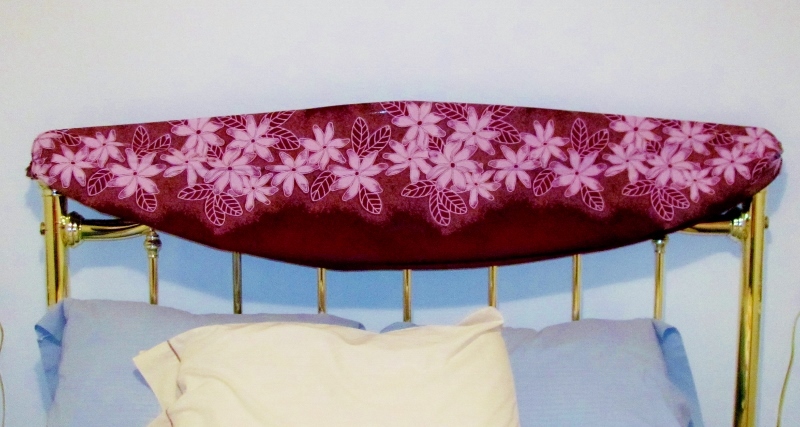 Below, over the back of the chair, is a blanket from Mexico. 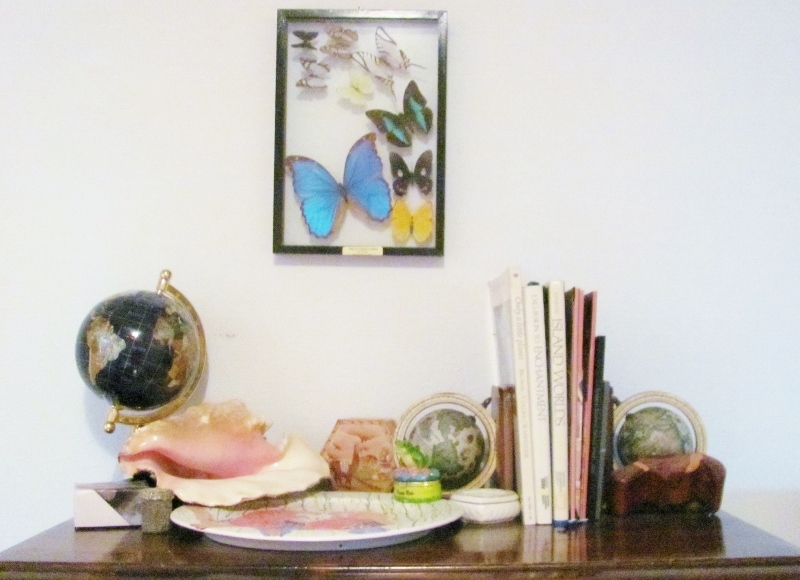 The left side of the window now has the display piece with multiple butterflies we got in St. Martin. 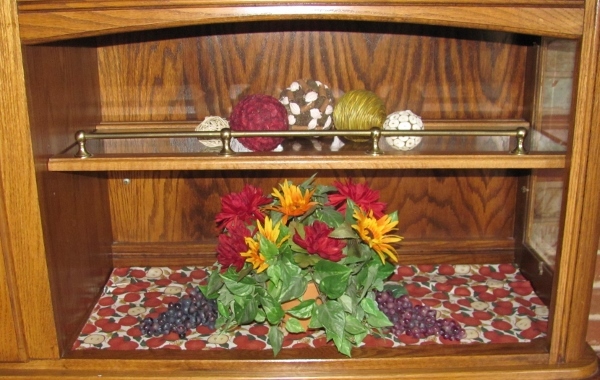 It is above the corner shelf on which the contents remain the same. 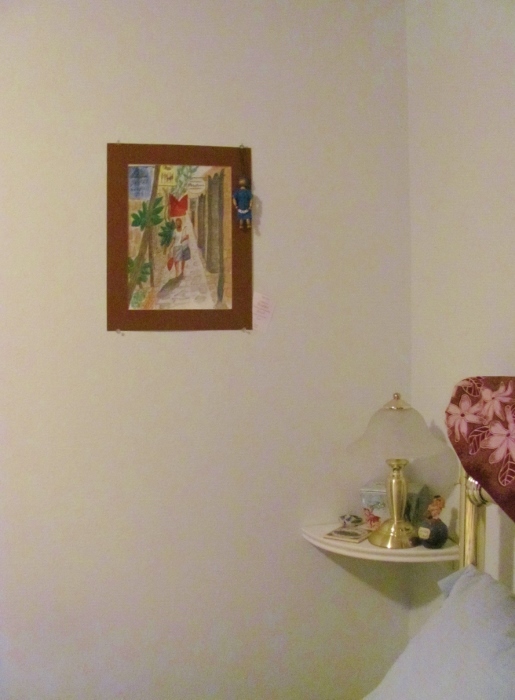 On the left side of the bed, the corner shelf display remains the same. Did you catch the addition here? 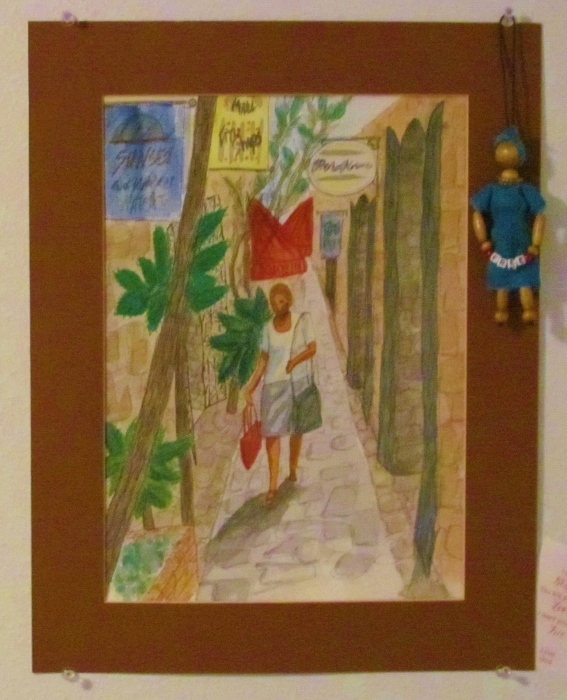 Long ago I painted this watercolor called St. Thos. St. from a photo I took in St Thomas. It never felt finished so I put it away. When I took it out for another look I got out the fine-line black pens and added defining lines and shading to it. I had the brown mat on hand and mounted it in that. I added a handmade doll made in Africa that I got at an event at a women's event at church. 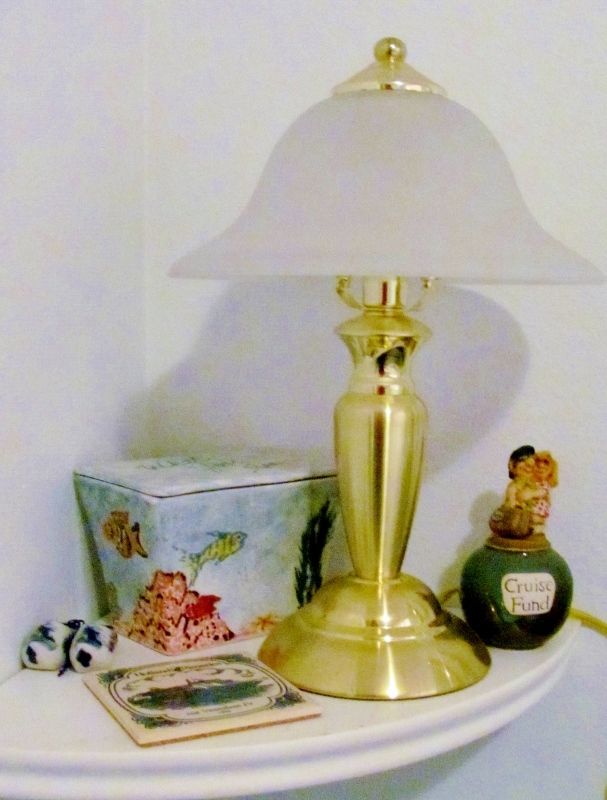 Not shown (because I forgot to photograph it) is the metal trash can that I covered with scrapbook paper that features old postcards. 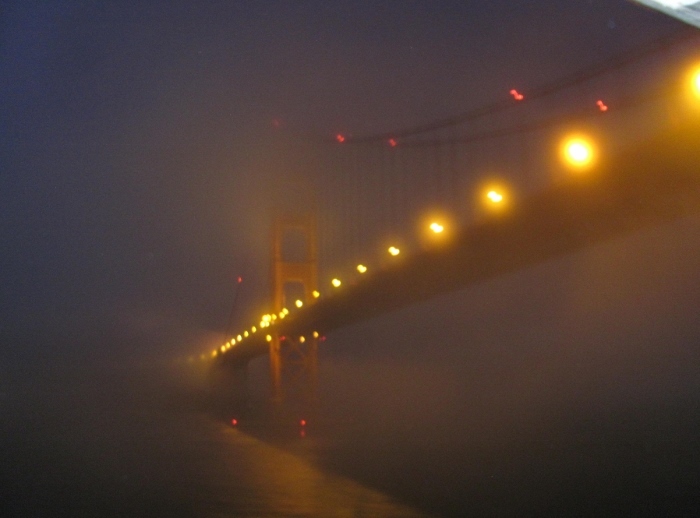 I also have on order an 8x10 of the photo I took as we sailed under the Golden Gate Bridge this spring. It will hang above the switchplate in the door alcove. 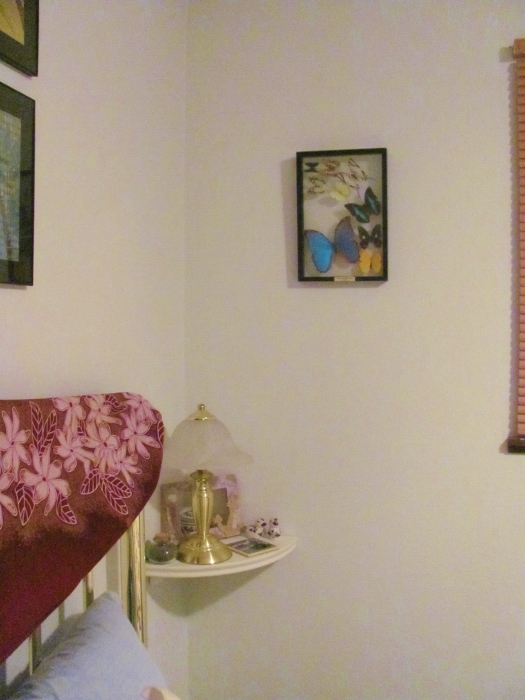 THEN the room will be complete - until we travel some more and collect more treasures! I had a sudden desire to change the decor in our guest room. 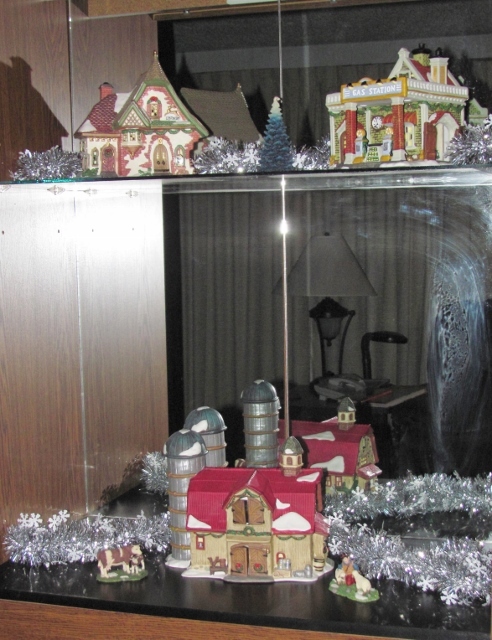 The old theme was lighthouses and I knew someone who would make good use of the items. 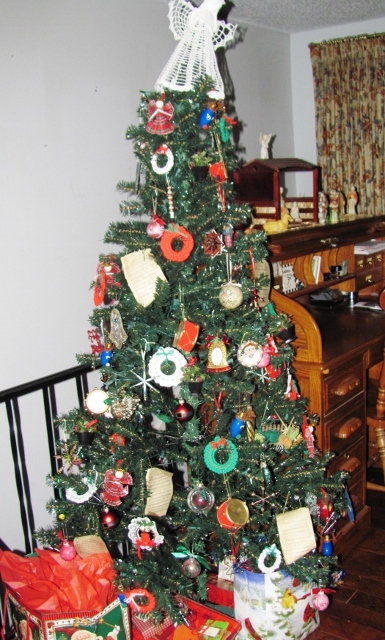 Within an hour I had brainstormed with Mom about a new theme and gathered items from storage, other rooms in the house and from various collections. The main display is on the bureau. On the wall is a frame of multiple butterflies from St. Martin, a stone globe picked up in Alaska, a box made on a cruise, a silver woven box from Mexico, a conch shell from Grenada, in the back is a leather box from Venezuela and in front is a large plate I painted on a cruise, perched on its edge is a frog box from Puerto Rica, and then there is box from the Beleek factory in Ireland. 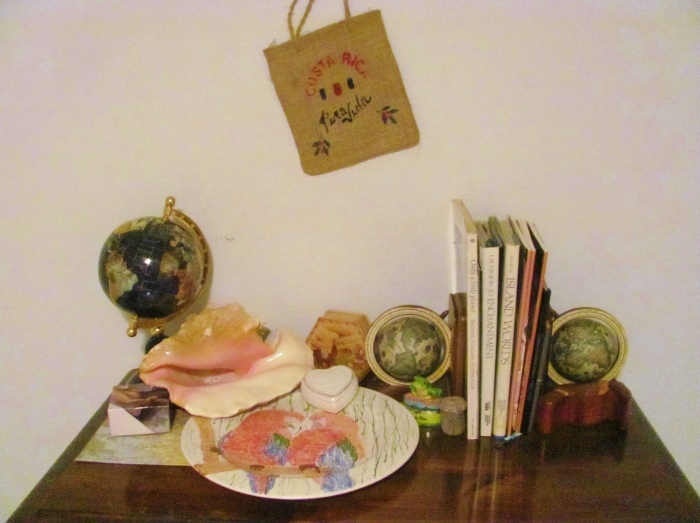 The globe bookends hold handmade and altered books with travel themes and on the right is a puzzle box from Costa Rica. This eclectic mix of elements is only the tip of the volume of travel items that I could have selected from as I buy boxes wherever I travel and make crafts on almost every cruise. But these things went well together and cover a wide scope of places we have traveled. I may do something more by adding artwork created with maps. 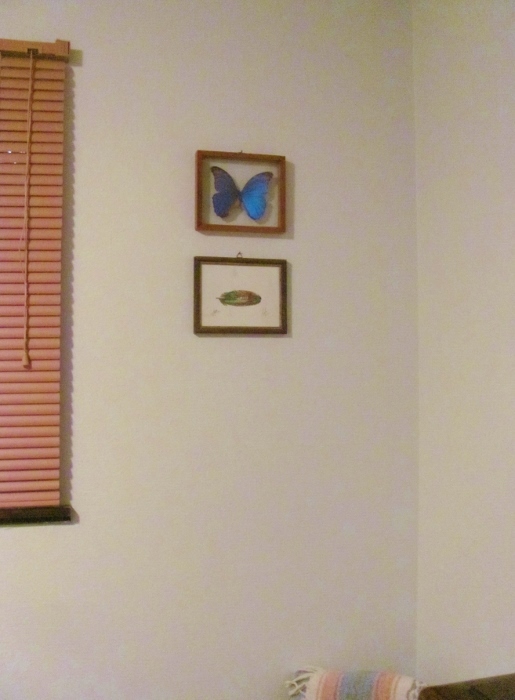 I do have additional wall space to play with in this room, so there will probably be more to come. Who Is Snacking On the Trees? Since the lady of the house has started back to work, the four of them now have started roaming the neighborhood all day rather than just coming out of their own yard to walk along. You never know which of 4 to 5 yards you'll see them in. They do go home to sleep and to lay their eggs, though. 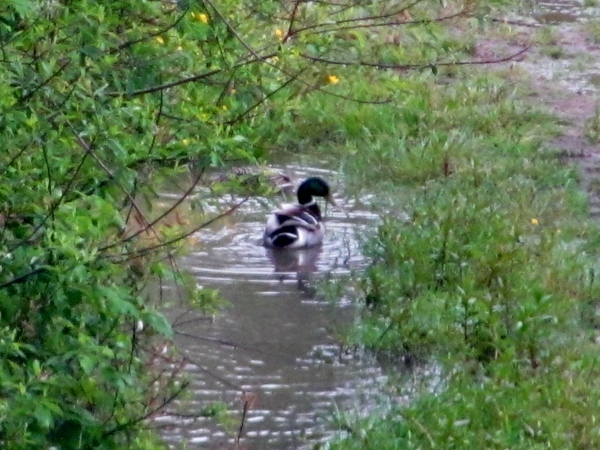 ANOTHER new guest to these here parts has been living in the pond on the property just upstream from ours. This neighbor has always had a small pond, but this winter we noticed we could see it more clearly than ever before. We assumed that a few trees may have come down to open up the view or maybe it was attributable to the record rains we've had. Then, the Mister was looking through the binoculars for an odd colored duck we've been seeing out there. WHAT?!?!? look at that freshly downed tree! That is on OUR side of the pond which is the downstream side. You can tell by the pointy top on the stump that some beaver has obviously been felling trees and building up the blockage at the outlet of the pond. This would explain why the pond is larger AND why the creek seems to flow through our pasture instead of flowing to the culvert like it used to. Makes a mess out of our pasture, reducing the use of it to stick-dry summer. But, the wildlife in these parts have the 'right-of-way' so there's probably nothing we can do about this (also, the pond is not on our property so the beavers are under the jurisdiction of the neighbor anyway). Mostly, we like the wildlife. But, gnawing beavers and gross-ugly nutria are NOT welcome here. 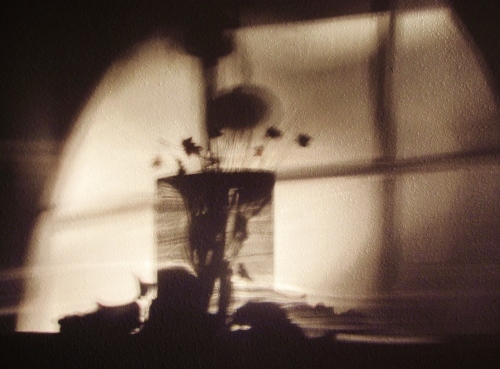 I noticed the other day how, when the sun shone in the window at a certain time of day, the shadows created by one of my decorating vignettes made a little artwork of its own. The trick is catching it at the perfect time - we're not always looking at that wall when it happens. I tried to get a good photo of it, but it does not come out as neat as just gazing at it in real life. I did get a couple that are passable. The 'live' version has a yellow cast to it, but the photos come out with a blue tint. I adjusted that to make it look more vintage with a color correction to sepia tones. Now I might have to start decorating with an eye to what kind of silhouette they will make! 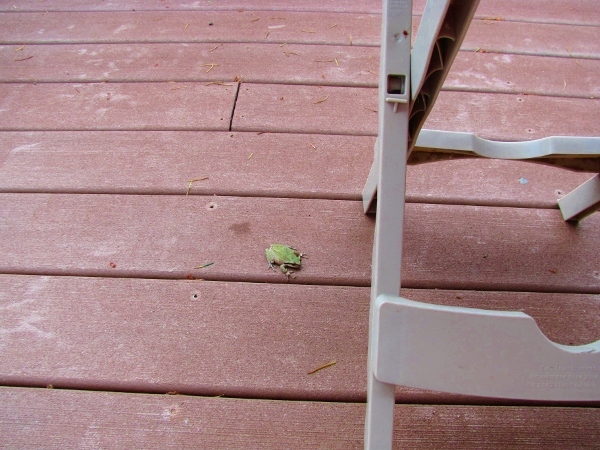 The other day both of us walked all over the deck, arranged chairs and a fold-out table, wiped down the chairs and when we sat down were shocked to see a little visitor up with us on the second story. Somehow we had managed to miss seeing him in all the activity and yet had missed stepping on him, too! He was so still we weren't certain he was still among the living but, when he was nudged onto a newspaper for transport, he demonstrated his good health and leaping abilities. Look at those cute sucker toes! 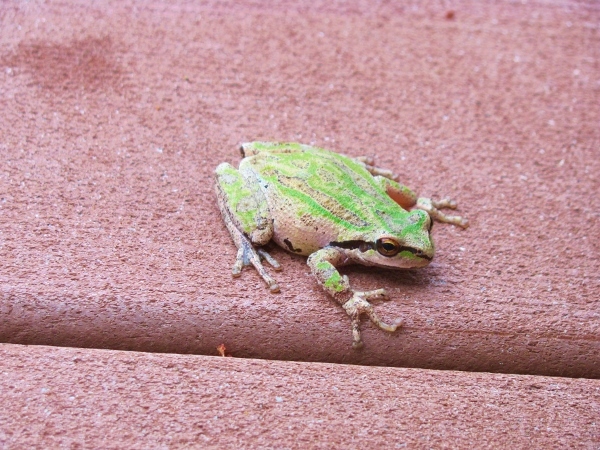 I assume he was able to crawl up the siding to get up to the deck. He did NOT take the same route down, though. 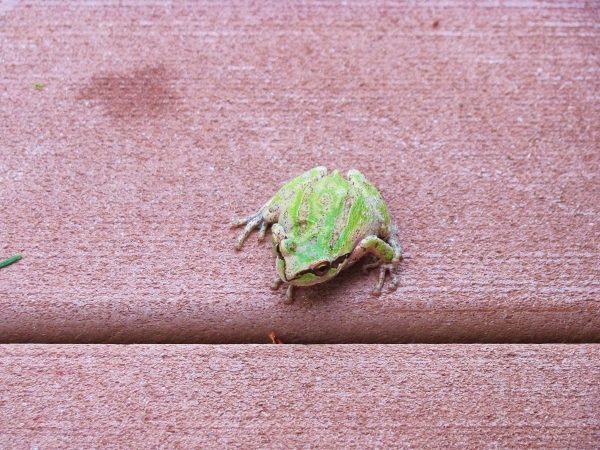 Our hudges with the newpaper encouraged him to take a giant flying leap off the edge of the deck. We must assume he landed gently and hopped away to a new home (because we would to hate to think anything bad happened to him). 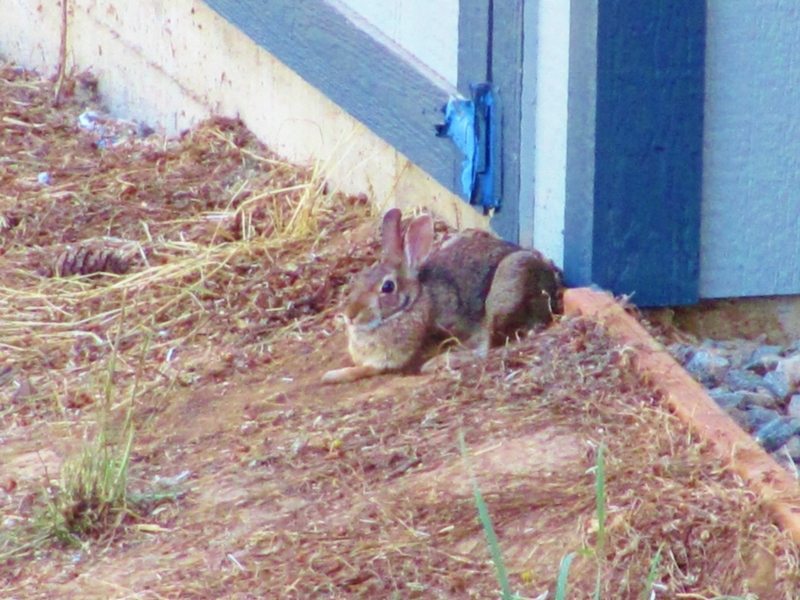 We've always had lots of bunnies living on our property and are always excited when we see a new behavior. It helps us understand them a bit more. We're also impressed at their camoflage and understanding of what they need to do to survive. What do you see? This was just a day after hubby finished painting the trim on the new shed shown in the upper right. We noticed a bunny hopping straight to the corner of the building, turn around facing out, and scrunching down to make herself blend in. 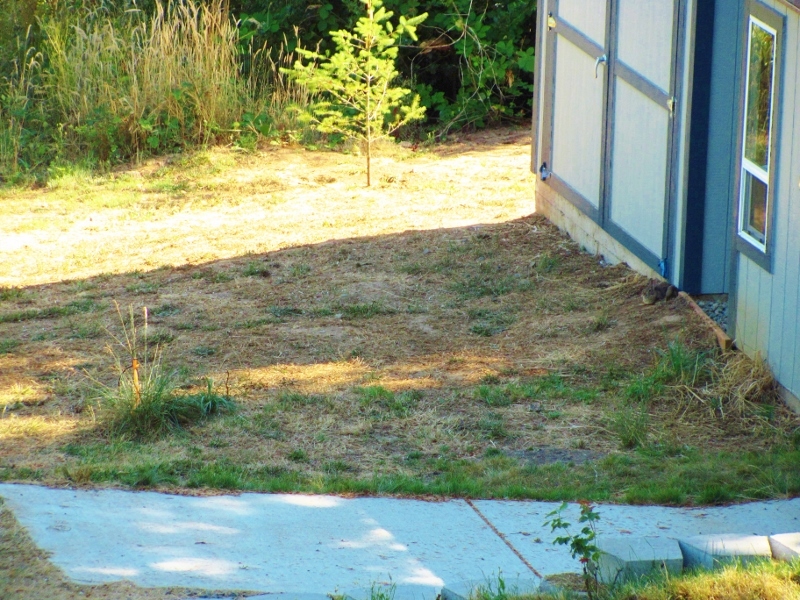 The next day she was still there but, when the sun shone on the front of the shed she moved to the gravel path between the two sheds and faced front again, from the shade. Later in the day two big crows landed on the lawn and strolled over to the tall grass around the small twig tree (lower left of photo). When either of them came within 10-12 feet of it that bunny came flying out of her corner and went on the attack.. She was taking on two birds that were bigger than she was and they were sneaky, too. 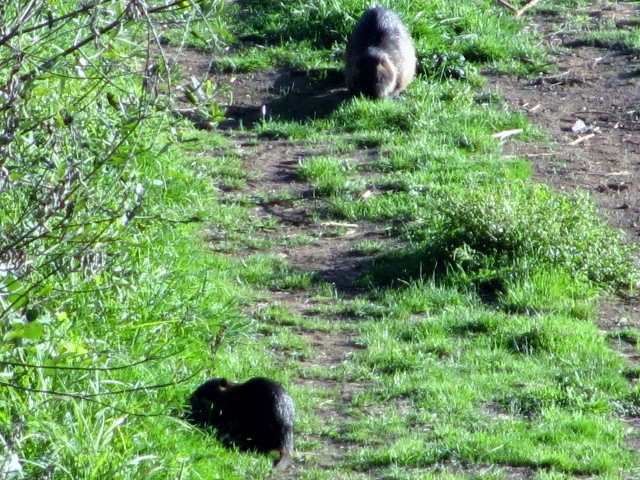 They split up and came from different directions but, I'll tell you, that bunny has some MOVES! The birds wised up and moved on. When we thought bunny was missing we got out the binoculars and saw her laying in the tall grassy area with her belly to the middle. YES, she's got a nest of babies in there and she only goes close to nurse them Otherwise she keeps her post in camoflage. We also noticed when two other bunnies came up to the general area and casually started grazing. 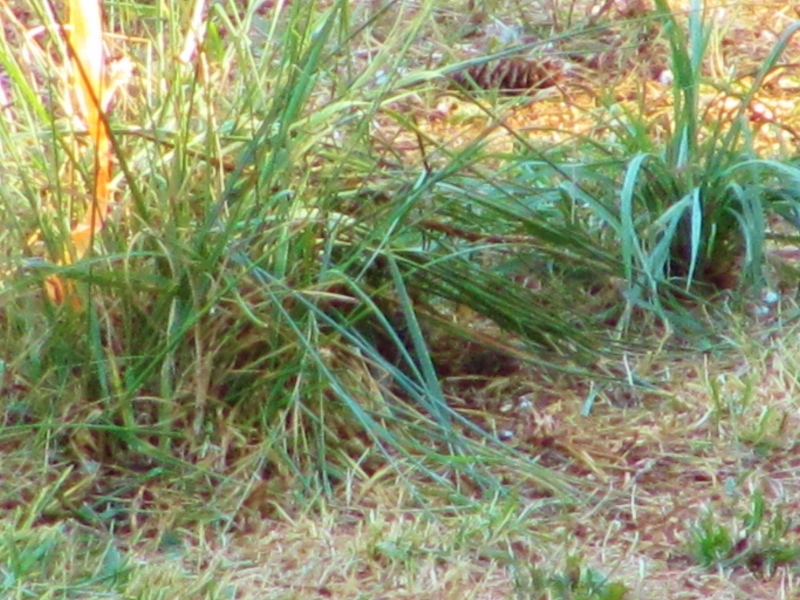 At this point mama bunny left the babysitters in charge and went off to the creek area. She was only gone about a half hour and when she took up her post the babysitters went back up the road. Oh, how I want to go get a closeup look at them. But she would just move them somewhere else. I'll be patient and wait for them to get pig enough to hop around their little home. In the meantime, we keep a BB gun at the ready to discourage any of the big birds that hang around. 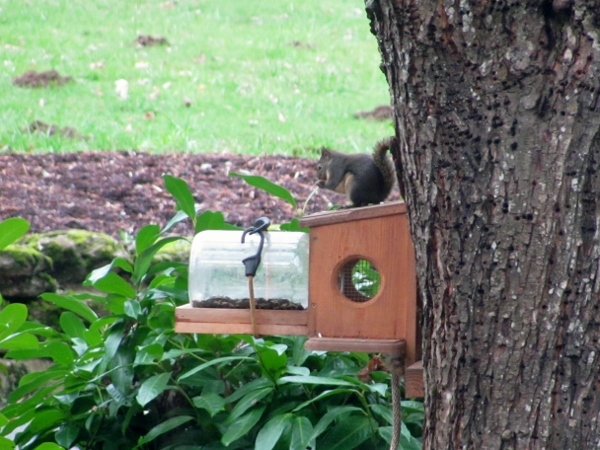 We have a new little buddy at the squirrel feeder! I'm not sure what kind he is but he is smaller than a chipmunk. The ones we have in spades are reddish brown on the back and white on the belly. They are about 7 inches. This guy is dark brown on the back and redish on the belly. He is about 3 1/2 inches tall. He can't seem to figure out the other feeder that requires lifting a lid with the head to access the seeds. But he is all over the jar feeder. 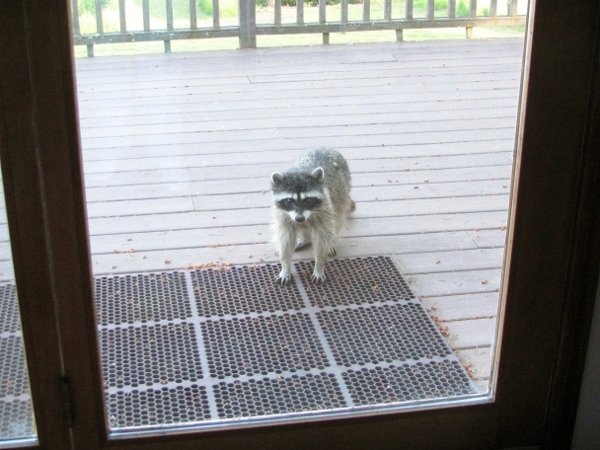 He pops inside, grabs a seed, scurries out to sit on top and eats the treat there. We are NOT running a wildlife park, despite the increasing number of animal sightings. We've lately seen the nutria come out of hiding a lot more and then suddenly, here she is with the ugliest baby on the planet. It, unfortunately, looks exactly like the adult - which is one of the nastiest looking things on the planet. 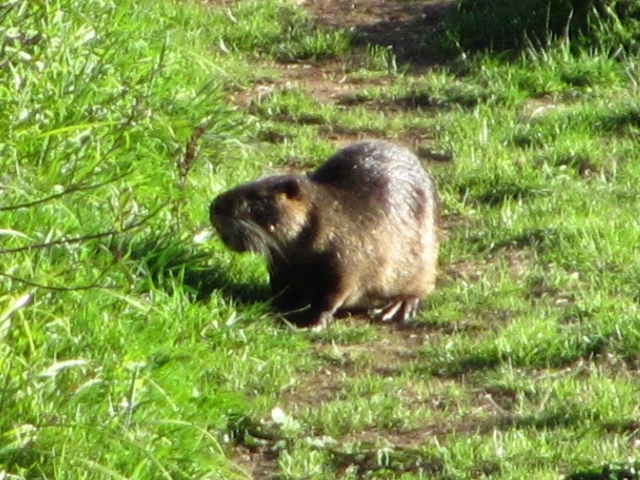 At about the same size as a beaver, this rodent has a giant rat-like tail and gnarly huge orange teeth. Because of their dark coloring and the bright sunlight it was difficult to get a shot with any detail. The question I have is - why doesn't the bobcat eat these nasty things instead of snacking on the cute little bunnies? The only entertaining thing was when the baby did not see mom come up from behind him. She touched his backside with her nose and he levitated several feet and jettisoned into the brush - much like a cat that has been startled. You wouldn't know by their lumbering gait that they were that quick and agile. We are always happy to see the deer wandering through the backyard and had caught sight of 4 different ones this spring. 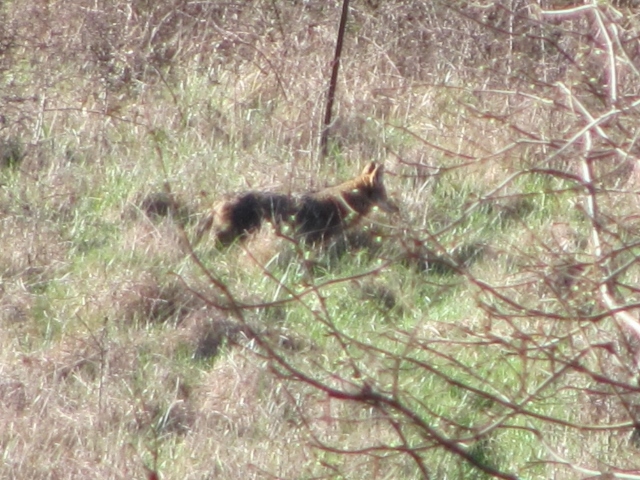 One looked very round and we assumed this was a pregnant doe and waited anxiously for the appearance of a fawn. A couple of weeks ago we finally saw when she brought them out of hiding - yes... two of them! This is the fourth year that a doe has dropped twins and nested them in our pasture. 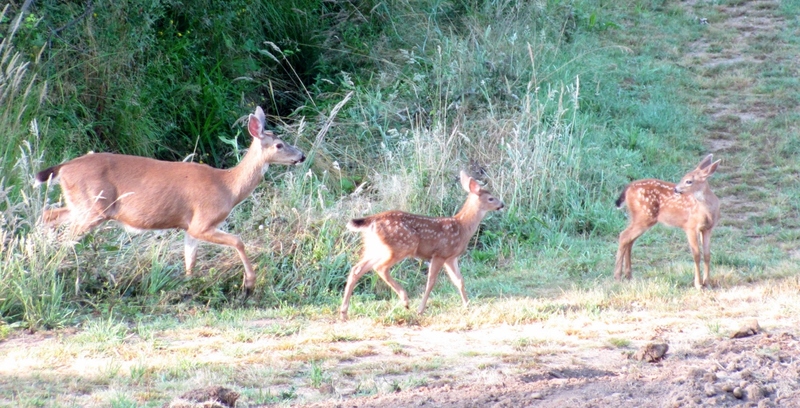 Most likely it is the same doe and the others hanging about could be her female children from previous summers. We finally managed to catch the little family with the camera and are ahppy to report that they all appear healthy. We have a new visitor to the house that, I swear, thinks she is the family dog. She comes up to the patio door and, if nobody pays attention to her she will lay down on the mat and go right to sleep. Now I know that having a passel of kids is probably wearing her out but, really! She shows up earlier and earlier, now arriving on the step long before he gets home from work. I know, I know, "Isn't she cute?" Well, yes she is cute, but she's also eating me out of house and home. Pathetic how that begging thing works so well. We seem to have some new residents in our yard. 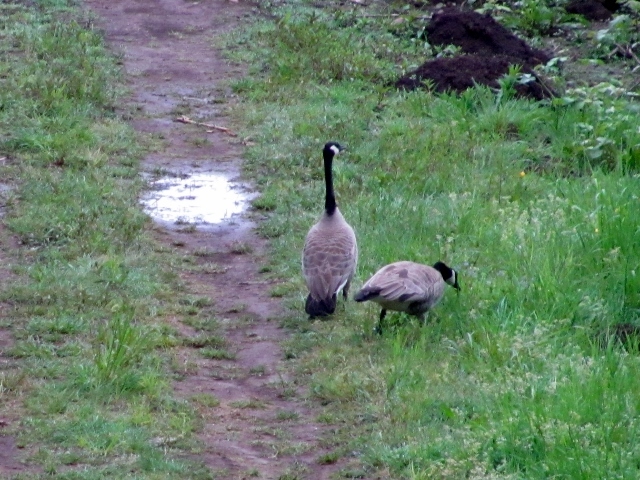 For a few weeks, this pair of geese have been seen strolling about the back lawn, up the access road, and in the pasture. Unlike the ducks who have also been frequenting the area, you can't tell who is the 'he' and who is the 'she' as one takes the lead for a while and then the other. Usually one is grazing while the other keeps a watch for danger and then they will switch off. We assume they are nesting in here since they only appear as a pair and it is the right time of year for that sort of thing. We're hoping we'll get to see little goslings waddling around at some time and also hope these will become permanent residents and not just tourists passing through. The duck pair do have at least three little black and yellow splotched ducklings. I was uable to get a photo of them but did manage to catch dad in a couple of shots. Mom is there on the left but blends in too well to pick out. 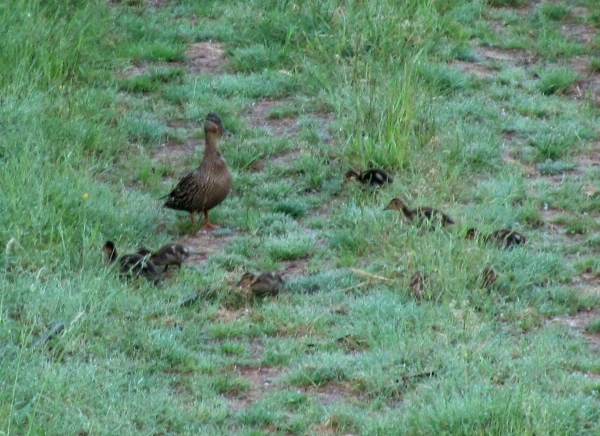 UPDATE: Okay, a few hours after this post went live the mama duck broght out EIGHT babies and herded them up and down the road, right up to the edge of the back lawn. 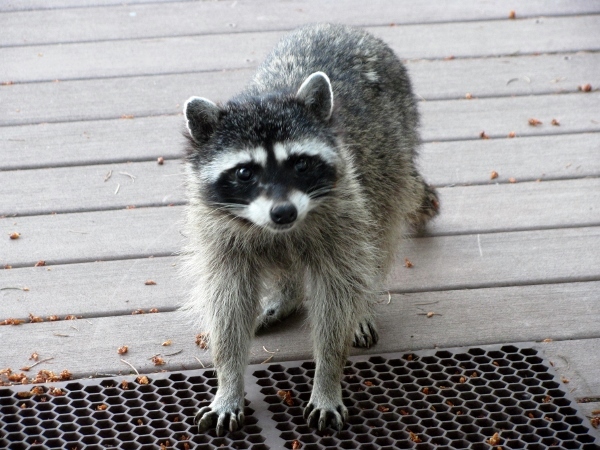 Then we had the first visitors to the new birdfeeders we put out off the deck railing. 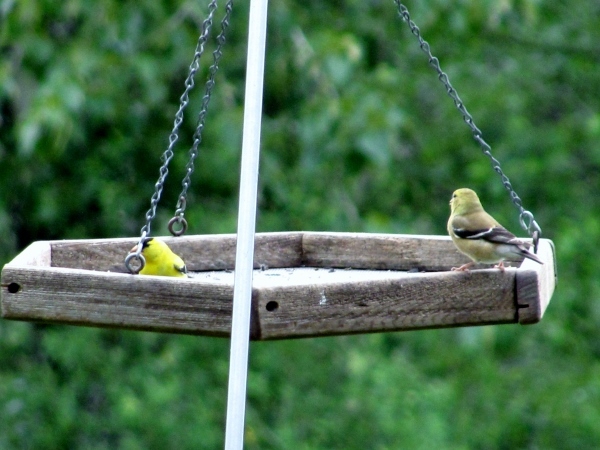 I believe these are goldfinches and we had put thistle seed in the feeder to attract them. What a lot of fun in our backyard this year! 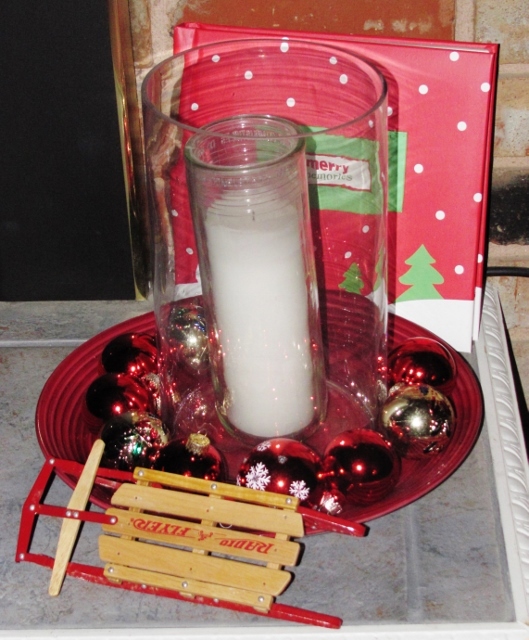 Here's a peek at the holiday table setting. 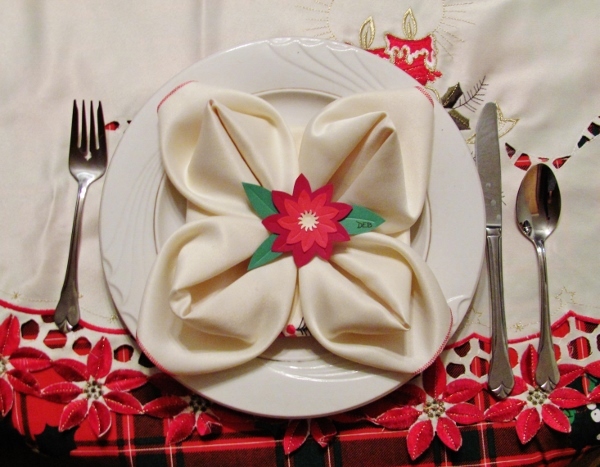 I had fabric napkins and looked online to see how to fold them like a poinsettia. This version was simple to do but ended up with a plain center. Off I went to the studio to make some centers with paper crafting. I used a diecut flower as a base but it was rounded petals. I hand trimmed them to a point. There were two sizes of the flower so I treated both the same. I used a stylus to score a vein down the center of each petal then layered them. I popped in a golden center of a punched sunburst. To turn these into place cards I free-hand cut three green leaves and scored a center vein on each. The name was hand lettered and the leaves glued to the back. These just lay on the center of the napkin. 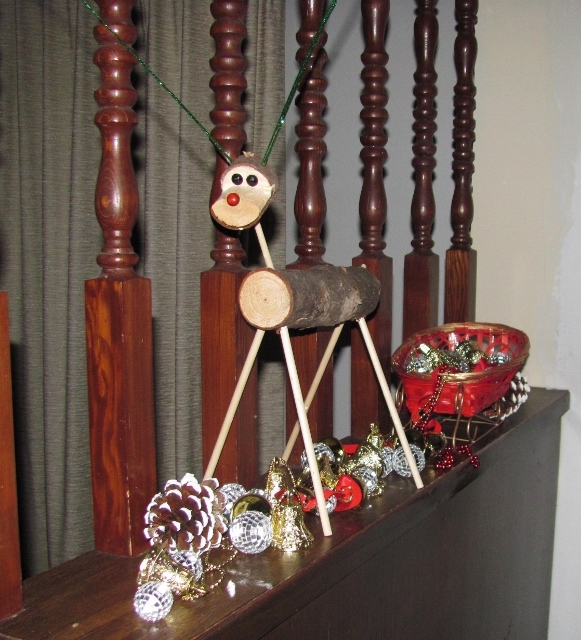 So you can get back to your holiday festivities I will quickly show the holiday decor at our house. Alright, everyone! Back to your presents and pie. 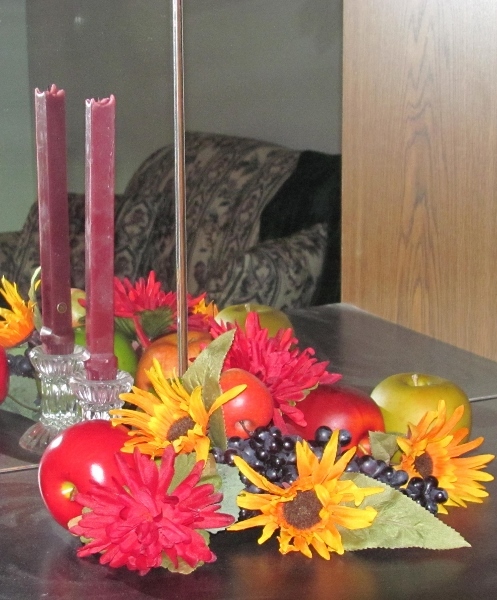 A little late, but I thought I'd show what I used to decorate the table for Thanksgiving dinner. 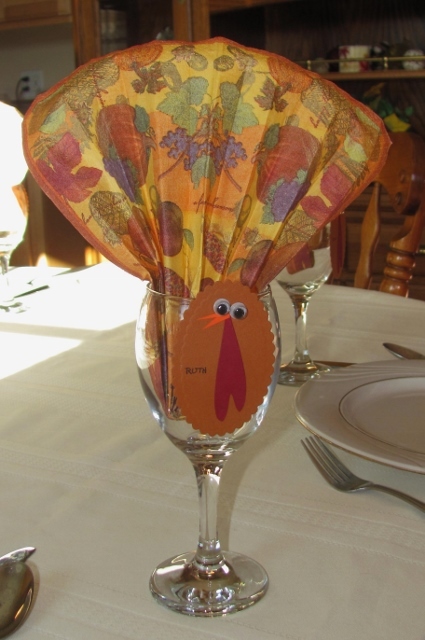 This combined the napkin, the glassware and the place card all in one! I opened the paper napkin out flat and pleated it. Then I folded over the base of it and tucked it into a wine glass. When I pulled out the pleats at the top it curved it over a bit and make it stay extended. From golden-brown cardstock I cut scalloped ovals and added a red upside-down heart, two tiny orange triangles and a couple of googly eyes. I wrote the guest names on the left side and... voila! With the approaching fall it was time to change out the home decor. 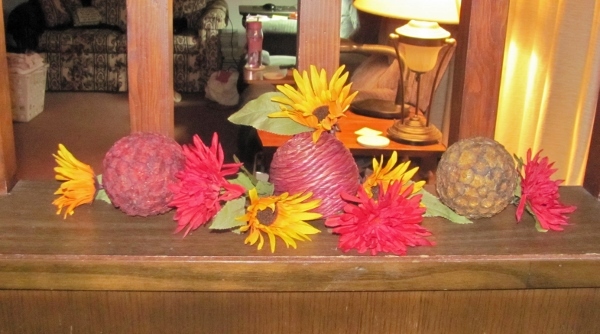 This time of year I bring out the plastic apples and silk flowers for a theme I call 'apples and asters'. 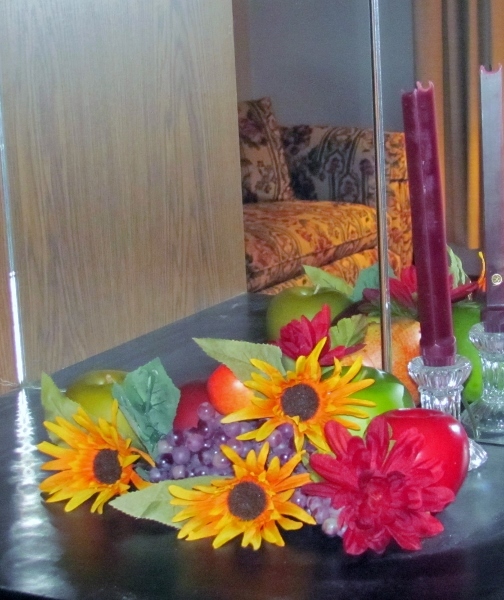 On the two matching living room mirrored cabinets I used arrangements with a taper candle in them. The hearth features a plated arrangement which has nested straight wide jars. 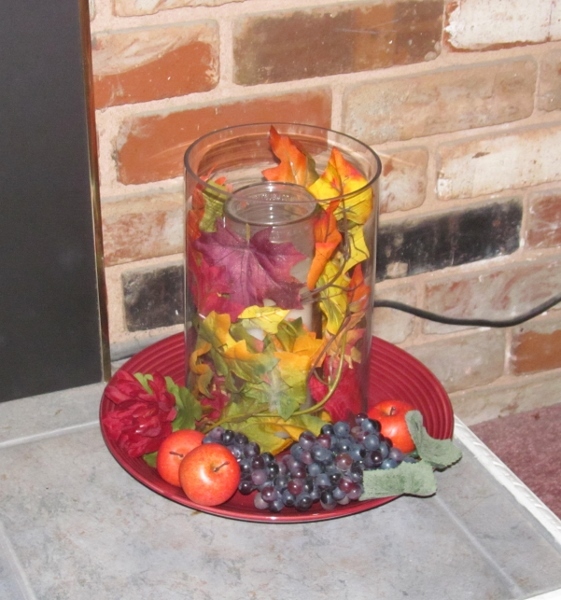 I used a vine of silk leaves to fill the space between the jars and arranged crabapples and grapes at the base. 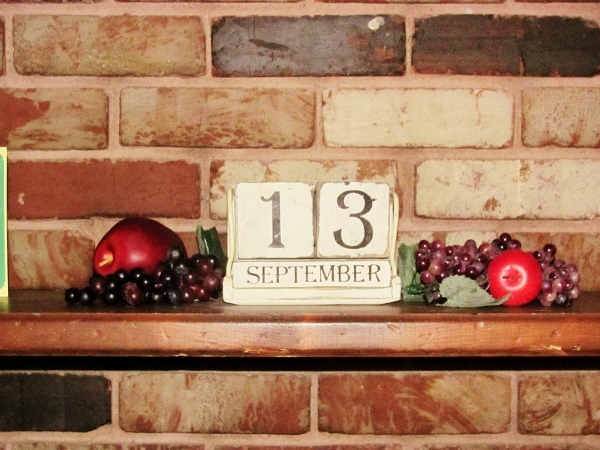 Above, on the mantle, are the calendar blocks with a bit of fruit around them. 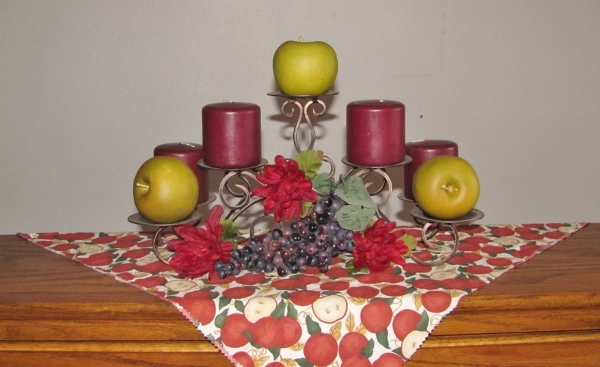 On the top of the roll top desk I used my favorite candle holder with some burgundy candles and granny smith apples I used some apple print fabric as a base. 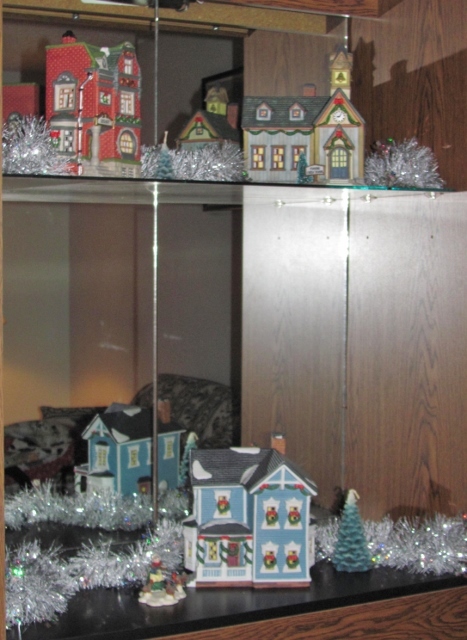 The last place I decorated was the alcove of the china hutch. Here I inserted some of the flowers into a faux potted plant. More of the apple fabric lines the lower shelf and the glass upper shelf features more of the decorated balls. And that concludes our fall home tour. I put up the summer decor (red, white and blue - stars and stripes theme) a few weeks ago then forgot to post. 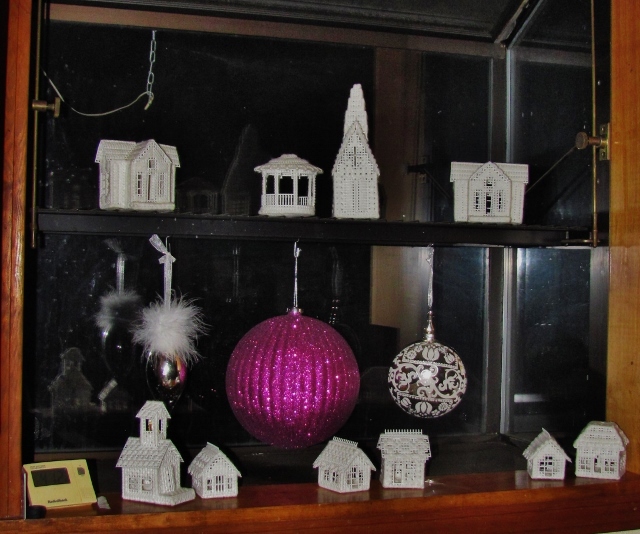 Most of it is the same (or similar) to the last couple of years but I wanted to show the display in the dining room. 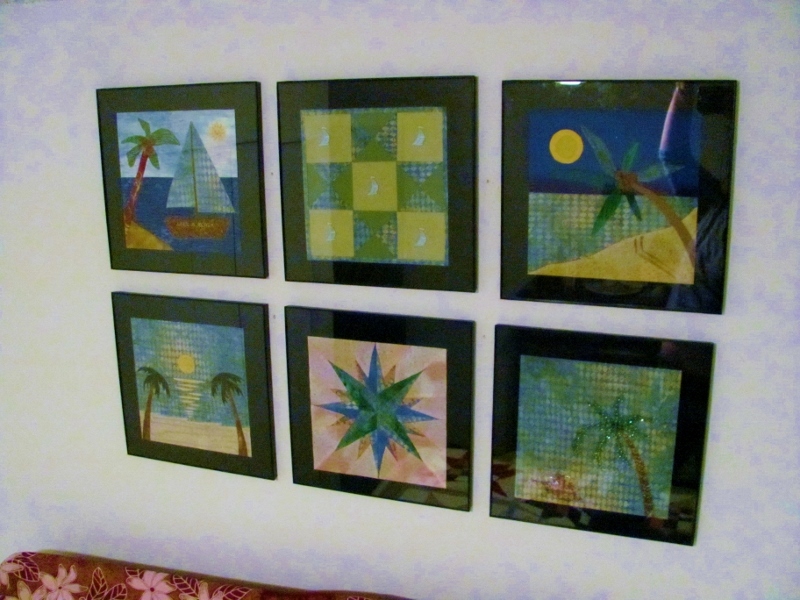 The mirror trivets are a new item in my decor box (thanks, Mom). They are in three sizes. 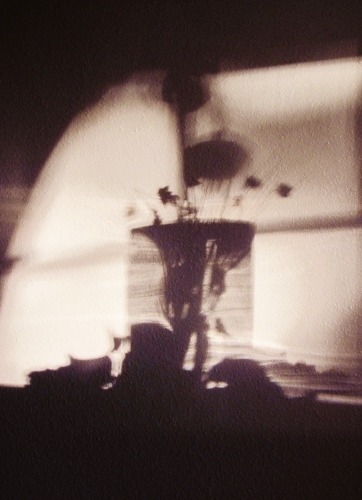 I used them as an element to tie disparate items together. 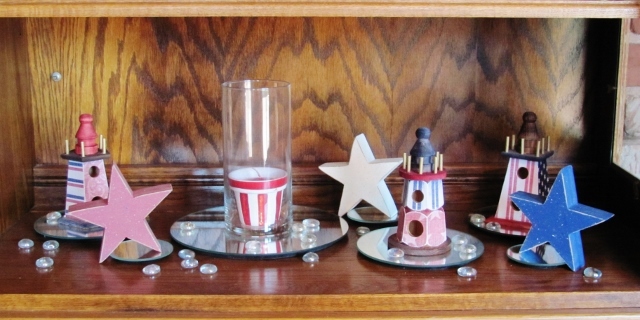 I included the painted wooden stars, the summer lighthouses, a candle in a hurricane vase and clear flat marbles. Everything is carefully arranged to look casually arranged! New appliances make me happy! I've been babying my old washer and dryer for a while now but they have not been pulling their weight. After 20+ years the washer agitation was spotty and loads had to be 1/2 sized to allow clothes to get moved around enough to get clean. The dryer took 1 1/2 cycles to get a load dry - even those 1/2 loads. Grrrr. 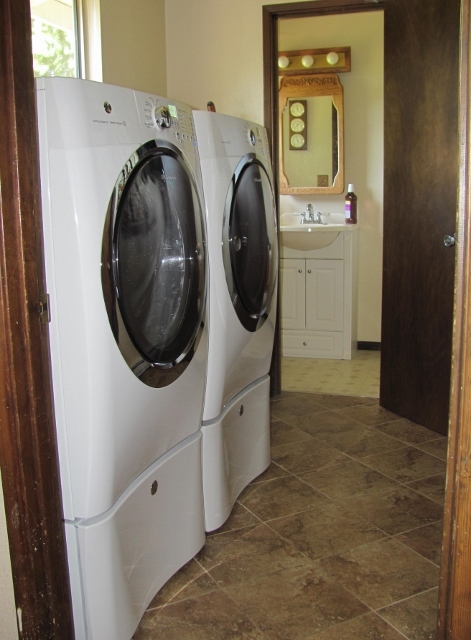 So, we went shopping for some new friends to live in the laundry room and they look very nice in their new home. I would have prefered a colored set but, when you shop the sales, you take what is available! Here are my high capacity, front load machines on their pedestals. I debated on the pedestals but then reminded myself that I do not stand around in there looking out the window, anyway, so why not. There is still enough light coming in. Now, I have to go teach them to fold laundry and my life will be complete. 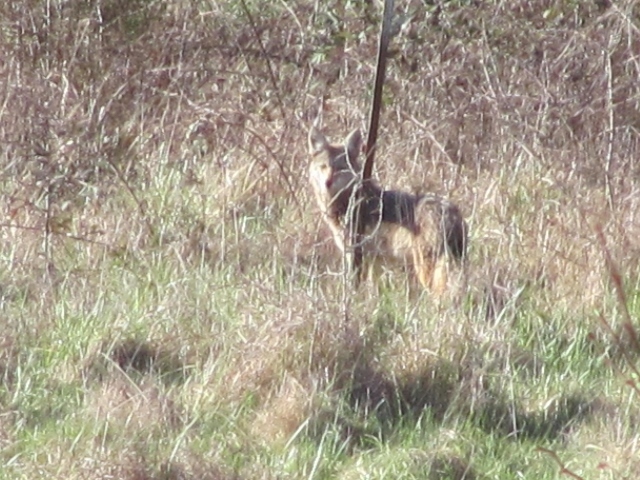 A few days ago hubby looked out the back window and spied a coyote out at the end of the yard. He has seen them at night going through the yard but always on the move. I've never seen one in the 24 years we've lived here. Imagine our surprise that this one just wandered around a bit, looked around at the scenery and even watched us looking with binoculars for a while. It suddenly occured to us to grab the camera and see if it would hang around while we took photos. We only got two shots before it moseyed off into the scrub brush and vanished. I suppose this means I will be saying adios to a few bunnies, mice and other little critters that inhabit this space. But it was neat to see this awesome doggie.